Morbach, a spa resort with a particularly healthy climate, lies on the northwest slope of the Idarwald mountain ridge opposite Usarkopf (724m), Sensweiler Heights (734m) and Steingerüttelkopf (757m) mountains. Typical of such northwestern slopes in the Hunsrück region are low moors, so-called "Hangbrüche", areas of wet, swampy ground which have developed in undrained depressions of the mountain slopes and form unique biotopes and refuges for rare plants and animals. These low moors are fed by an abundant supply of spring water from the Idarwald heights and result from constantly accumulating moisture, which collects in the depressions where alumina (clay) greatly hinders the drainage or runoff of water. The special living conditions in these depressions, which are permanently water logged, have over many hundreds of years led to the creation of unique bog land and peat. In contrast, high moors draw their water exclusively from rain. Common to both types of moors is a certain lack of nutrients, which leads to the growth of specific plant communities here: rare peatmoss (Sphagnetum magellanici in a narrower sense), various types of sedges and rushes, as well as typical moor plants like the Arctic Starflower (Trientalis europaea), the cranberry (Vaccinium oxycoccos), the peat-specific Spotted Orchid (Dactylorhiza sphagnicola), the Bog Asphodel (Narthecium ossifragum), the Round Leaf Sundew (Drosera rotundifolia), which compensates for the lack of nutrients by capturing small insects, or the Royal Fern (Osmunda regalis). Many of the moors are covered with alders and birches. Characteristic of peat-building vegetation is that peat moss continues growing its entire life in the upper part while the part underneath, the older part, dies and converts to peat. This extremely delicate ecosystem is coming increasingly under protection in order "to preserve moorland as a habitat for rare wild plants and plant species whose existence is threatened" (cited from the state's mission statement). Among the botanically most interesting low moors of the region are the protected Ortelsbruch (accessible by wooden footbridges and a nature trail), the Palmbruch (a natural monument) and the Engelswäsgeswiesen near Morbach (a nature reserve since 1987). Not far from Morbach, near Wederath, where Hunsrückhöhenstraße Road and Highway B50 cross, lies the ancient settlement of Belginum on the Roman Via Ausonia, which leads from Mainz, past Bingen, and on to Trier. 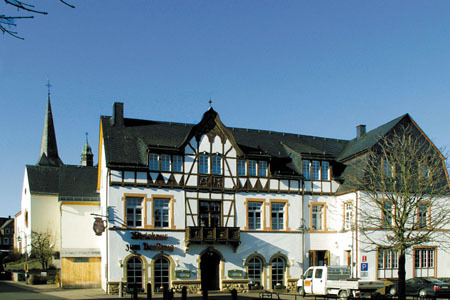 The village of Belginum ("Vicus Belginum") was built along a single street ("Straßendorf"), commercially and strategically well placed on the crossroads of the west-to-east-running Via Ausonia and the north-to-south-leading road that connects the Mosel and the Nahe rivers. Both roads already existed in Celtic times. During Belginum's heyday, the second and third centuries AD, about 200-300 inhabitants lived here in buildings that were a combination of living quarters, workshops, and shops. There was about a 600m long row of houses, right next to each other, with their gabled ends towards the street and possibly a covered sidewalk. There were also two temple areas and a Roman warehouse somewhat north of the settlement. The special significance of this ancient transportation junction was also particularly emphasized by the nearby —in the Wederath district "Hochgerichtsheide"— Celtic churchyard from the Latène Age and Roman times with 2,500 graves, 500 ash pits and other cemetery features such as funeral gardens, paths, and protective barriers. Today an ambitious museum project, "Belginum Archaeological Park" (Archäologiepark Belginum), has been realized at this still significant junction. Part of this is a museum opened in 2002, whose interior gives you an opportunity to get a comprehensive overview of the entire ancient surroundings: to the west towards the temple district, to the north into the Mosel Valley, to the east towards the ancient Wederath graves field, and to the south towards the settlement Belginum. The community of Morbach, together with the neighbouring communities and districts, has worked to create a network of archaeological monuments in Hunsrück. The world-renowned movie director Edgar Reitz comes from Morbach. His well-known film trilogy "Heimat", the story of a family in Hunsrück, has become a memorial to the area. It is not surprising then that a key scene in the movie was filmed near Morbach at Baldenau Castle. As the only moated castle in Hunsrück —built around 1320 by Balduin of Luxemburg, the Archbishop and Elector of Trier (1307-1354)— its unique location and mystic charm create a perfect setting for great stories. And this has been the case ever since Balduin's time.